Saturday’s three games in Division One of the Halifax AFL resulted in away wins for Northowram, Illingworth St Mary’s and Sun Inn Rastrick. Northowram dominated the first half against St Columba’s at Natty Lane with some crisp passing and movement but the best chance fell to Saints’ Frank Odion, who side-footed wide after rounding keeper James Bunn. It was 1-1 at the break, Craig Collins’ powerful angled free kick flying in four minutes before half time, only for Chris Gent’s reckless tackle to give Ryan O’Neill the chance to equalise for the hosts from the spot. The second half was more evenly contested but the Rams still looked the better side. After 73 minutes Calland’s close range header put them ahead and when Collins’ innocuous free kick from 30 yards bounced at least twice before deceiving the keeper it looked game over. However, O’Neill set up a frantic finish with his second for Saints, who had won their previous two games this season. Illingworth, who came down from the Premier with Northowram, were handsome 4-0 winners against Elland Allstars at Greetland with Joe Griffin (two), Paul Livesey and Nathan Sloane their scorers. Promoted Sun Inn Rastrick put defeats in their opening two matches behind them with a 5-2 success over Salem at Shroggs Park. Nick Green and Luke Simmonds scored for the hosts but goals from Daniel McLeod (two), Dominic McLeod, Ryan Barkham and sub Kerrigan Mitchell gave Sun the upper hand. Calder ‘76 Reserves beat Stainland United 3-2 in Saturday’s sole Division Two contest. It leaves Stainland, last season’s Division Three runners-up, still looking for a first point in the higher section. The two games in the bottom section produced 19 goals and away wins. 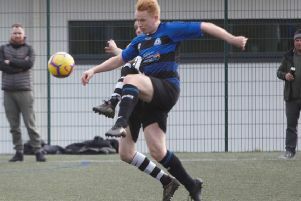 David Oakes scored a hat-trick in AFC Crossley’s Reserves’ 8-4 win away to Warley Rangers at Savile Park. There were also two goals for teammates Matthew Clark and Toby Bates plus Adam Sykes and Ashley Holmes for Rangers. Shelf FC Reserves made it three wins out of three with a 5-2 success against Elland United at Carr Green. Ewan Gardiner came off the bench to score twice for them.